George Washington only made one journey outside of the continental United States and that was to the island of Barbados. It was a short but influential stay for the young Washington. Now, the house in which Washington stayed has been restored and is open to view by the public. Although Washington arrived in Barbados by ship (the brigantine Success), he was not on a cruise vacation. Rather, in 1751, Washington's older half brother Lawrence was suffering from tuberculos. In those days it was believed that the gentle breezes of Barbados had recuperative powers that could cure this usually fatal disease. Therefore, the Washingtons made the long sea journey from Virgina to Barbados for medical reasons. The Washington family was an important family in colonial Virginia and Lawrence was the head of the family. Their father had died when George was 12 and Lawrence became a father figure to George. Accordingly, when Lawrence decided to go to Barbados, 19 year-old George went along to accompany and assist Lawrence. Arriving in Barbados, the Washington's ship anchored in Carlisle Bay off of Bridgetown. Today, that area is known for its popular beaches but in those days it was a thriving port, often with hundreds of ocean-going sailing ships riding at anchor. Due to its strategic location at the western edge of the Atlantic, Barbados was an important transhipment point for cargoes between England and the British Caribbean islands. In addition, the sugar plantations of Barbados produced valuable cargos that required transportation. The Washingtons had expected to stay with the Fairfax family, who had relatives in Virginia. However, when they arrived in Barbados, the Washingtons learned that there had been an outbreak of small pox on the Fairfax estate. Consequently, they decided to find other lodging. After staying four days in Bridgetown, the Washingtons rented a house from Captain Edward Crofton. Known as the Bush Hill House, the house was on the outskirts of Bridgetown with a view over Carlisle Bay. The rent was quite steep - - 15 pounds a week (roughly the equivalent of $3,000 in today's money). However, the location near Bridgetown, the view and the gentle breezes that blew through the house were what the Washingtons were looking for and so they agreed. The house had been built in 1715 as part of a 43 acre estate. It was not an elaborate manor house but rather more the equivalent of the type of house that a manager of a plantation might inhabit. There were two bedrooms on the ground floor and a large dining/reception area with some additional dormer rooms above. Lawrence was too ill to do much socializing but as a member of a prominent Virginia family, George was invited to take part in Barbados society. As mentioned earlier, at that time, Barbados was a rich and important colony and so the society was more sophisticated than back home in Virginia. Indeed, George saw his first theatrical production in Barbados. 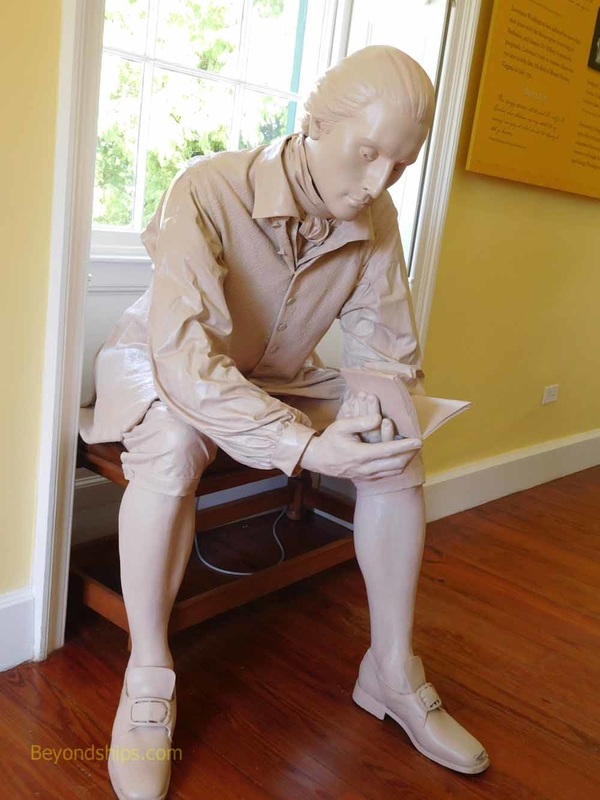 Thus, the visit to Barbados gave Washington a more worldly view. The military commanders not only invited George to dine with them but also to see the island's fortifications and other defenses. Thus, Barbados gave George an introduction to the professional military that would serve him later in his careeer. From the Bush Hill House, George could see the masts of the ships anchored in Carlisle Bay. To one trained as a surveyor, it was a simple matter to calculate the value of the cargoes. Clearly, Barbados and Britain's Caribbean possessions were more valuable than its holdings on the mainland. This knowledge would serve him well in the American Revolution. Not only the presence of American privateers in the Caribbean but the presence of the colonists' French allies, required Britain to deploy significant forces to protect the Caribbean rather than fight the rebellion on the mainland. Despite the Washingtons' efforts to avoid the disease, George contracted small pox during his stay on Barbados. It was often a fatal disease but George survived. This gave him an immunity to small pox, which was extremely valuable when small pox ravaged the Continental Army during the American Revolution. It also gave him an appreciation of the disease and led him support early attempts at vaccination. After some six weeks in Barbados, it was clear that the breezes were not helping Lawrence. Therefore, the Washingtons left the island with George heading home to Virginia and Lawrence going to Bermuda to see if that island's breezes had a curative power. Unfortunately, his stay there was no more successful than his stay in Barbados and he returned to Virginia, where he died in 1752. 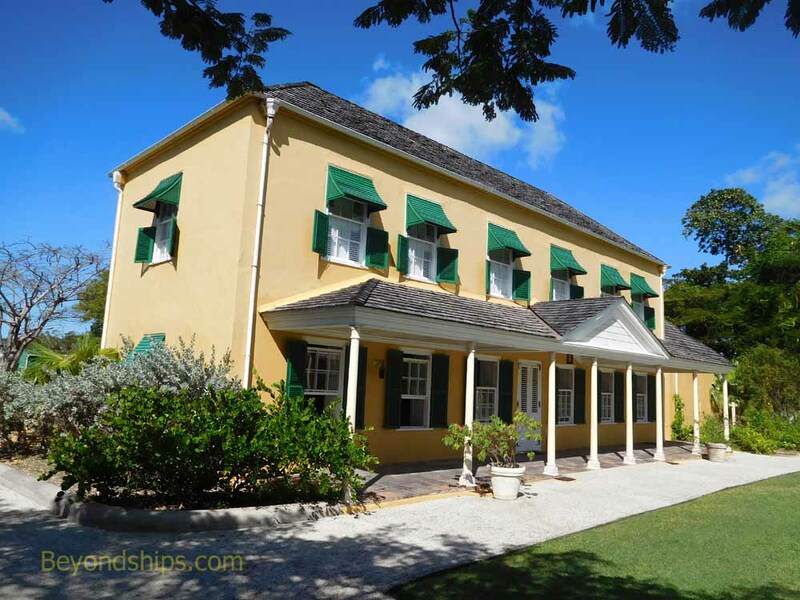 The house the Washingtons stayed at in Barbados was sold to the British military shortly after Britain decided to station a large permanent garrison in Barbados in 1789. Whereas Jamaica would be Britain's main naval base in the Caribbean, Barbados would be the center for its ground forces. As a result, the house was used primarily as a residence for senior officers until the garrison was withdrawn from Barbados in 1905. It then went into private ownership serving as a residence and later as offices. The house was acquired by the Barbados government in 1999. An ambitious restoration project was commenced and the house opened as a heritage site in 2001. The George Washington House is located just outside of downtown Bridgetown. Around it are other buildings erected by the British garrison as well as the Barbados racetrack. It is a quiet area with tall trees shading the properties. A low wall surrounds the parking lot. Sitting behind a nicely manicured lawn, the house is an ochre color. During the period when it was part of the garrison, extensive re-modeling was done. Most of this was reversed during the restoration project but it was felt that it would not be possible to eliminate the second story that was added in 1845. While it may not look just the way it did when Washington was there, from an aesthtic point of view, the house is more eye-pleasing as a two-story building. In addition to the main house, there are several out buildings. These include a bath house, which was powered by a windmill-like pump, a privy, and a kitchen building. In the 18th century, the kitchen was separate from the main house both because of the heat the kitchen generated and because it was a fire hazard. Inside the house, the ground floor has been restored according to plans dating from 1804 – the earliest known plans. It has been furnished to look as it might have in 1751 with a combination of period pieces circa 18th century and reproductions. Overall, it is a charming house with natural light and the island breezes the Washingtons were so desperately seeking. The second story is a museum. Most of it is dedicated to telling the story of Geroge Washington in Barbados. However, there are also exhibits about the garrison and on slavery in Barbados. During our tour, we had an excellent guide who spoke with passion about the house and its restoration. He also provided insights to show that Washington's brief stay in Barbados had long-term historic consequences. 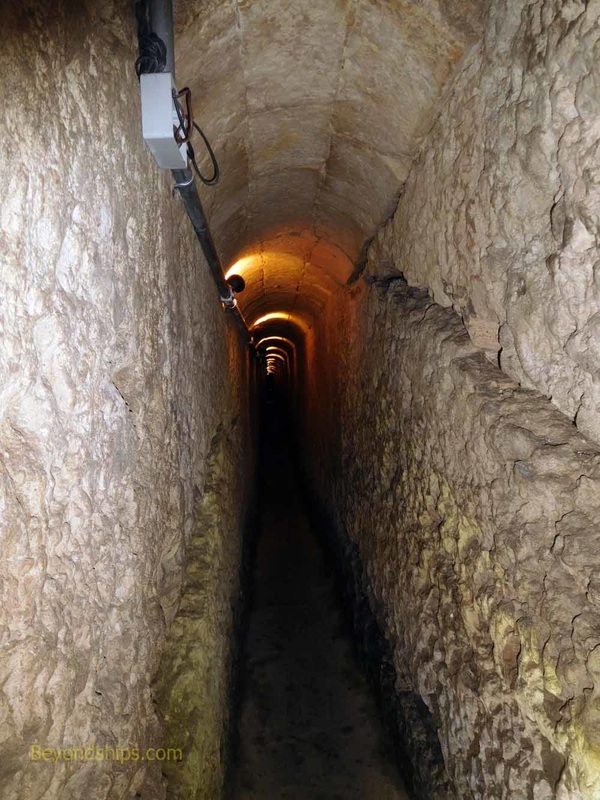 Underneath the George Washington House and the other properties that were once part of the Barbados Garrison are miles of tunnels. These were built by the British in the 19th century in order to act as communication links between the Garrison's important buildings and as an escape route in case of attack. They were all but forgotten in the 20th century after the British troops left and regarded as something of a myth. Recently re-discovered, a portion of one of the tunnels is now open to view.